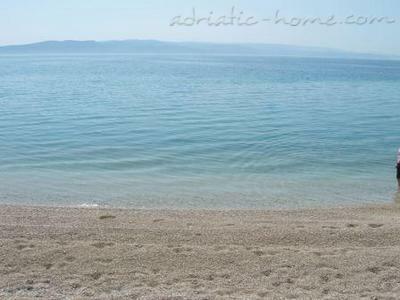 Villa Sodan Brela Croatia is situated 50 m from the beautiful pebble beach (seen on the picture) by the crystal clear Adriatic sea. 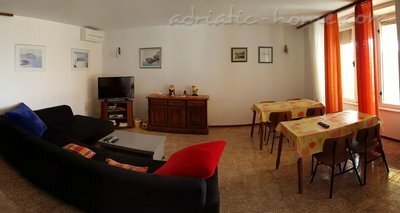 The house Villa Sodan Brela Croatia has 5 rooms, a spacious living-room of 25 m², two kitchens of 16 m² each and a terrace of 30 m². The rooms are double, but they can by inserting additional cots easily convert into three bed or four bed rooms at your request. All rooms have a private bathrooms. Rooms with bathroom are between 16 m² and 19 m². 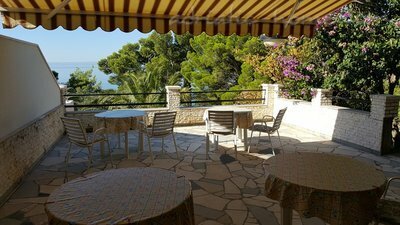 Each room has its own table on the terrace. The living room is equipped with a big-screen TV with SAT system and computer with Internet access for personal use. At your request we can prepare and serve breakfast. 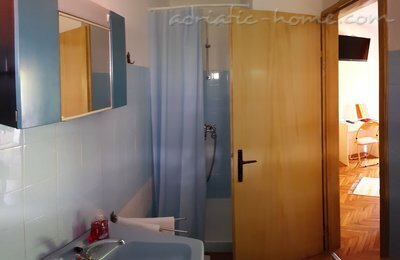 For larger families or group visits you can rent two or more rooms (up to 5), in which case you will have your own kitchen, the idea being that the entire house (five rooms) can be converted into a big apartment where each room will still have its own bathroom. 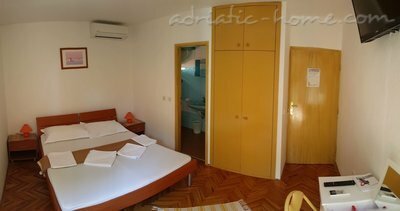 That being the case, we can rent you an apartment within our house with up to 10 or even 14 beds, its own kitchen and the above described living room (apartment house). The beach has a blue flag of the European Union indicating the level of cleanliness of the sea water and the beaches is up to highest standards. 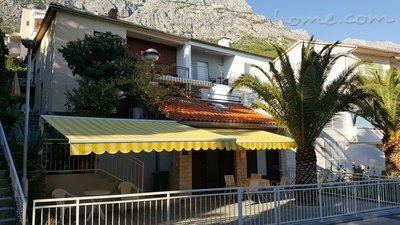 Our house Villa Sodan Brela Croatia is perfectly situated, bearing in mind that it is located only 400 m from the center of Brela (5 to 10 minutes walk), 1,000 m from Baška Voda (10 to 15 minutes walk), 200 m from the Berulia hotel, 15 m from the supermarket (opened from 07:00 till 21:00) and 150 m from the nearest restaurant. There is a large parking-lot in front of our house, so each room has its own parking place. 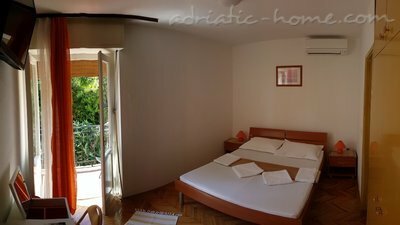 In view of all of the above, you can easily conclude that in our villa in Brela, you can spend a quality vacation without even using a car. 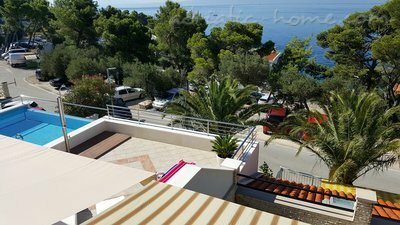 If you really want to have a good rest, your first choice should be a room with a private bathroom with an access to kitchen where you can prepare your own breakfast or order it from us and consume it on the terrace with a beautiful sea-view, whereas in the evening you can eat in one of the prestigious restaurants in Brela or Baška Voda. 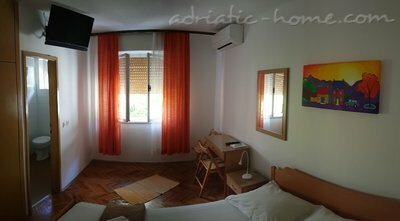 Thank you for visiting our web pages and we hope that you will visit us and enjoy our pleasant accommodation and natural vistas that only Brela can offer. And do not forget - Brela are blessed with a 5 km long stretch of pebble beaches with beautiful and well-light promenade stretching along the entire beach. Three beaches have been awarded the Blue Flag of the European Union. Our beach, Berulia, is one of them.